The annual Society of Imaging Informatics in Medicine (SIIM) held its annual meeting on June 6-9 in Grapevine, TX, which is located in the Dallas metroplex. Here are my findings of the latest and greatest based on what I saw and heard; some of it I literally heard through the grapevine. Unlike radiologists, who are trained and used to thinking in multiple dimensions by merely looking at 2-D images, many physicians, especially surgeons, have a problem sometimes following certain anatomic structures, such as the many twists and turns of the small intestines when looking for a blockage in 2-D. Radiologists in general are able to visualize the information pretty well by mentally integrating the information at hand, if nothing else, as they have been trained for many years to do. Most physicians are more 3-D oriented, however, and find that an extra dimension is very helpful. An upstart company at SIIM created yet another dimension, they call it “true 3-D” and dubbed the traditional 3-D application as “2.5-D,” however, I believe it is truly a new dimension, i.e. a 5th dimension. 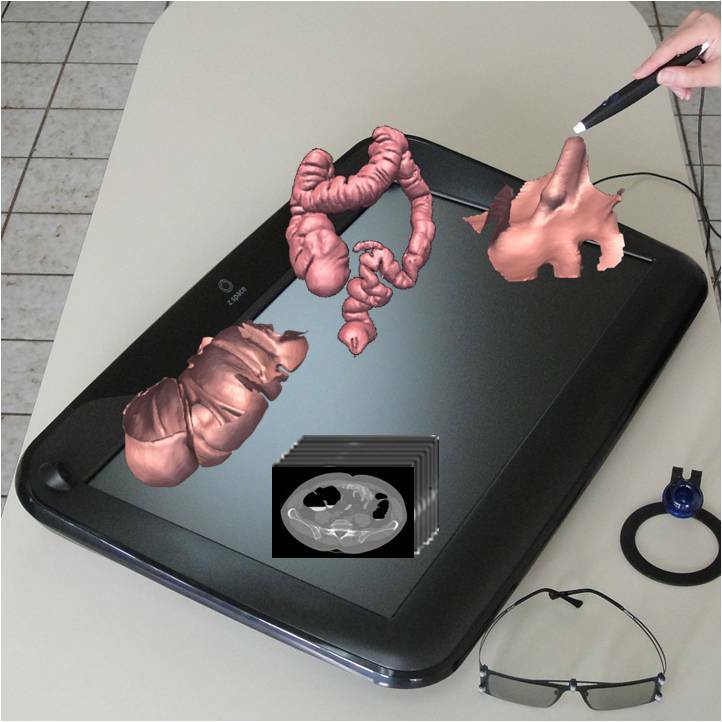 It works as follows: using a custom-built monitor, images are stacked and 3-D presentations are viewed by using a pen held in front of the screen. In addition, there are also two sensors that track the position of the 3-D glasses so that the user can move his or her head as well to get different views. Lastly, the 5th dimension comes into play because one can literally pick up a specific organ and lift it out its anatomic structure. It can be used, for example, to see exactly where certain arteries are attached. Early studies have shown a significant efficiency improvement reading certain studies. This is not going to be your day-to-day reading station, but for niche applications it could become a major asset. As of today, when you have a cold you might see a physician, and you could be prescribed antibiotics that seem to work on most cases, but you are one of those exceptions that is allergic to that specific medication and have to go back and forth a few times until you find what works best for you. The course of action for a particular diagnosis is determined by evidence of what works and what does not work for a large group of similar patients. Currently Electronic Health Records, supported by sophisticated decision support tools, rely on the evidence-based research to suggest the best course of action to the physician. Still, in many cases it could be hit and miss for the prescribed treatment, which might be OK if it concerns treating a cold, but might be critical if it determines treating a patient with a potential life threatening disease such as cancer. Here is where personal medicine comes in: your DNA could be matched with DNA’s from similar cases and based on that information it has been proven that a much more effective course of action could be taken. As Dr. Siegel from the VA in Baltimore pointed out in his presentation, in the near future, imaging professionals will have to be prepared to review and consult genomic data in conjunction with the imaging that was performed and use that to determine a diagnosis and suggested course of action. The VA has information, as of today, on about 22 million patients in their database, one million of whom have genomic data recorded, which can be applied to these types of situations. This is still very much in the beginning phase as it takes supercomputer power to crunch all of that data, it also will have a big impact on storage requirements as this information is quite large (could be 50 GB, which is about 100 times the size of a typical CT study). However, in the near future we will be able to consult and use information from this analysis to make a better diagnoses. The clinician workstation has undergone several transformations. Initially, it was a thick client running mostly on a Windows® platform. That was replaced by browser-based technology, thin clients, and as of last year, the buzz word has been zero-footprint. The latter has as advantage that, if implemented well, there is no trace left behind after a user logs off or closes the window, which is preferable from a patient security perspective. In addition to changing the underlying software display technology, the source of the images has shifted from the main PACS server, to a dedicated web server, and now the Vendor Neutral Archive or VNA. As a “true” VNA (at least in my definition) is also able to manage non-radiology and non-DICOM images, such as MPEG’s, JPEG’s documents and other image types, the viewer should be able to accommodate these types of objects as well, hence the term “UNI-viewer.” Another requirement is that this viewer can either be launched or be embedded in an EMR application to allow a physician to have a patient-centric rather than a departmental view of the patient information. I am sure there will be another round of confusion about what a true UNI-viewer can or will do, for example, will it be able to render all types of DICOM image objects as well, such as the enhanced MRI and CT, the new digital breast tomosynthesis images, and show presentation states (I sure hope so) as well as measurements from a structured report. The problem is where to lay the boundary, i.e. will it also display CAD marks, and do 3-D MIP, etc.? The bottomline is that UNI-viewer is just another term and to find out what a device really does, one needs to pay close attention to the technical specifications, especially the DICOM conformance statement. There is no disagreement that the DICOM protocol is complex and not very suitable for exchanging information over the internet. The first attempt to fix this was by defining a protocol for exchanging secure email and information over the web, called DICOM WADO (Web Access to DICOM Objects) dating several years back. This did not quite meet the requirements and as a result, MINT (Medical Imaging Network Transport) was defined and actually implemented by a few vendors, but it did not really become very popular. The reaction from the standards community is a set of so-called RESTfull (Representational State Transfer) services which will maintain the DICOM encoding, according to which billions of images exist today while using the http protocol for exchange. These services are the RESTfull version of WADO to retrieve images and include the following specifications: STOW-RS for store-and-forward services, and QIDO for Query by ID for DICOM Objects. Some of these standards are still being worked on and are not quite included as part of IHE but there is no question that these are promising services and will potentially allow image enabling for the EMR and provide a means for external access of images. The patient-centric approach is clearly driving the need for multiple image sources in addition to other clinical data. The departmental radiology or even cardiology PACS architecture as we have known for the past 15-20 years is disappearing. Images are being archived at an enterprise level or regional level, access is through UNI-viewers and through image enabled EMR’s being sourced by an enterprise level Vendor Neutral Archive. The support role is also shifting to an enterprise level IT role rather than a departmental (i.e. cardiology or radiology) role. A poll during one of the SIIM sessions showed that as of today, for about 50 percent of the institutions the support role is with the enterprise. To be able to support this architecture, healthcare imaging and IT professionals need to learn about web services, HL7, and the characteristics and workflows of other modalities and departments, and have a thorough understanding of the overall architecture and workflow. The traditional Radiology Information System or RIS companies are threatened by the EMR capability to provide centralized order entry (CPOE). The intelligence and decision support rules to determine that performing yet another CT is justified is at the EMR level anyway and it therefore makes sense to have this functionality at that level. As Dr. Siegel pointed out, a radiologist cannot know if the 21st CT scan for one person is justified and the 9th for another might not be, if one does not know the patient background, history and diseases. There is also no question that a RIS module, which is part of an EMR has a tighter integration with the EMR than a separate RIS, which is typically integrated using HL7 transactions. In addition, EMR companies are often throwing in their radiology package for free, which is somewhat deceiving as the actual implementation cost could be quite high. The result is that stand-alone RIS systems are disappearing, which is kind of a mixed blessing. An issue is that the capability to provide standard protocols and procedure descriptions is not always as sophisticated in the EMR as it has been in the RIS systems because of their experience. A Dr. David Avrin from UCSF commented, it really does not makes sense to build all these tables for each EMR installation, but, rather try to find some common ground based on, for example, the RADLEX terminology. California has required dose tracking since 2012 and the state of Texas just followed suit, meaning that the two most populous states already require dose-tracking, which will most likely be followed by several other states. The how, what and where of the dose recording is still not quite obvious; standards are defined as part of DICOM and in corresponding IHE profiles, there are several vendors on the market that can connect to the modalities and/or PACS and collect this information either directly or by “screen-scraping” the CT dose overview screens. However, it is not about dose reporting; the intention is to use this information to characterize usage, benchmark it, and provide decision support rules about appropriateness of X-ray exams. As one of the speakers mentioned: technology is easy, but dose management is about establishing a cross-functional committee, determining how and where to collect the information and decide on how to act on it. Only then, can a doctor decide that another CT-scan should be performed with a more dose-efficient protocol, or be replaced by another imaging alternative. A major SIIM activity has been the discussion of “Transforming the Radiological Interpretation Process (TRIP™). However, in my opinion, these discussions did not seem to go anywhere except for some crystal ball reading and discussions on where we might be going in the future. The good news is that there now is a real-life problem being addressed as part of this initiative, called the SIIM Workflow in Medicine (SWIM™) project. This addresses the problem of using different terminologies for workflow states with different semantic meanings. For some of these workflow states this might be easy to interpret, for example the state of a report being “signed,” but what does it mean that a study has been “verified?” And even the term “verified” or it’s opposite “unverified” is not even used by every vendor and might have a different semantic meaning. This standardization effort would also allow information systems such as a PACS, RIS, CPOE and others to use these statuses to act upon. I have witnessed a situation where the appropriate status from a pharmacy system allowed a patient to automatically check in at a kiosk to see if the prescription was ready, but the RIS, which did not support the same status would not communicate that in the corresponding HL7 message, and therefore the information could not be used to automatically check into the department. There are about 140 events defined as well as 10 KPI’s (Key Performance Indicators), e.g. report turn-around time). This information will most likely end up in RADLex and assist the implementation of workflow management software in the not too distant future. We can then truly implement what Brad Ericsson of the Mayo clinic calls a “HEWEY,” or HL7 Enabled Workflow Engine. As one of the speakers mentioned “everyone has a digital camera” which means that the proliferation of non-DICOM images in hospitals is getting out of hand. Dealing with all of these JPEGS remind me of the early years of DICOM standardization: there are issues with color consistency, pixel sizes, etc. The workflow is quite different for these applications, for example, if a dermatologist wants to take a picture, or the ER physician photographs a wound, they just take a camera and shoot without “traditional” ordering or scheduling. Not only are there static pictures, but also video clips acquired for a variety of reasons, for example, taking a video clip of a person’s gait before and after surgery. The discovery process of where images and videos are created is just beginning and the process to make this part of the patient record will take some thinking with regard to proper identification. Standardization of the acquisition protocol is important, for example, if a picture of a skin lesion is made at the first visit with an i-phone, the second visit with a high-res camera, and the third time with a tablet computer using a flash, one can imagine that the color consistency, size and presentation, in addition to the encoding, (JPEG, JPEG compressed, TIFF) could be totally different. Standard settings might work in an office but maybe not in an ER. The other concern with these pictures are that there are different privacy concerns, as it might be one thing to include a chest X-ray in a EMR showing a fractured rib, but it is more sensitive to show the result of a physical abuse case with pictures of the victim/patient. Policies and procedures on the acquisition, identification and archiving of these pictures have to be defined and implemented. The PACS webserver clients and clinical workstations are going to be replaced by image enabled EMR’s. In the case of a PACS system, one needs to worry only about a few interfaces (except for the modalities and workstations of course), which is typically a RIS, maybe a worklist provider/broker and a voice recognition system. An EMR however has typically dozens of interfaces, as an example, the one at Johns Hopkins in Baltimore has 86! DICOM structured report information such as from ultrasound measurements might end up in a document such as a CDA, defined by HL7 version 3. The overriding message at the EMR integration sessions was that the integration effort was grossly underestimated, and that the support personnel better become aware of the intricacies of HL7 really fast. As was stated: if you have seen one HL7 interface, you have seen one HL7 interface, meaning that there is a fair amount of customization and mapping being done in interface engines and gateways. Image and information professionals will have to deal increasingly with the HL7 protocol as orders now will be placed at a Centralized Physician Order Entry (CPOE) system, typically embedded in the EMR, while the reports are going to end up in the EMR as well. · SOA is in, maybe? Service Oriented Architecture has been touted as the best thing since sliced bread for the past several years, in particular by Paul Chang of the University of Chicago. And yes, it is a great platform for integrating multiple applications, and if you are in a position to have a large IT development team you can do the customization and the integration yourself using the respective API interfaces. However, if you are a small or mid-size institution, you are interested more in plug-and-play capability based on standards such as HL7 and DICOM than having to support a machine level, tightly connected interface. Therefore, yes it is great, but if you consider the number of people who are able to make use of this capability, it is really more of a toy for institutions with significant IT resources than a main-stream required feature. · XDS-I is in, maybe? Almost every imaging vendor claims to support XDS-I (Cross Enterprise Document and Image Sharing) in the PACS, and/or archive. For most buyers this has become a standard “check-mark” similar to being “DICOM compliant.” The actual number of implementations however have been very limited, at least in the US. Apparently, of the estimated 300 Health Information Exchanges (HIE) in the US, there are less than 2 percent supporting the exchange of images. How images are going to be exchanged is still a big question. Private companies, as well as most PACS vendors, are providing cloud services for image exchange. Some of these exchanges are merely an intermediary, some also provide data storage. The “Image share” initiative by RSNA, which was implemented by five academic institutions based on a grant of several million dollars only enrolled a meager 3000 patient participants. Except for proprietary solutions, there does not seem to be an alternative for XDS-I, but unless an alternative comes up, this might or might not become the way we are going to exchange images. To cloud or not to cloud, that is the question, with or without XDS-I, we will have to see. And last but not least, is SIIM itself out or in? However, in contrast with other professional organizations such as HIMSS and RSNA, it is interesting to see that the attendance to the meeting is declining. I have heard from several attendees that there was not much “news” to hear or to see and that vendors are not offering much innovation anymore; they spend more time in EMR rather than in the imaging, especially the PACS area. However, I would throw this argument back to the user community and especially SIIM, to think outside the box, take off the radiology cap and think outside imaging, and think about enterprise workflow, and step out of the department to see what is done at the institution level and challenge the vendor community to come up with innovative solutions by presenting problems to be solved. With regard to the SIIM program, Instead of dedicating program tracks to talk about entrepreneurship, career development, and reinventing the radiologist role, it might be more beneficial to provide the training, education and tools allowing these role changes to take place. This would require bringing in people from different specialties such as dermatologists, cardiologists, pathologists, and others as well as from different domains such as IT to replace or at a minimum augment the current faculty. To be honest, I know by now more about the University of Chicago, Cleveland Clinic, UCSF and other hospitals than I probably would care for and rather love to hear how Texas Health Resources, HCA, or my home-town Denton Regional Medical Center or other non-academic institutions take care of their problems as these are the places where most of the audience works. A good example of a session where real life problems are being covered was at the satellite meeting about Digital Breast Tomosynthesis (DBT). In this in-depth discussion of the issues around this new technology (and there are quite a few major issues) a panel of users, consultants, vendors and the FDA, presented major problems and issues openly and frankly and, in the spirit of SIIM, solutions and roadmaps to resolutions were presented. The CBT issues range from the presence of proprietary encoding of the DBT image, to choking infrastructure due to the fact that the studies are a factor of 20 larger than the conventional 4-view digital mammo images. In addition, many of the PACS vendors cannot accommodate these new objects, or best case, only archive and do not display them. Let’s hope that the SIIM leadership will make this type of interactive session part of the future programs so that we can continue to have a thriving community where image and informatics professionals can gather. So, in conclusion, is SIIM out or in? In my opinion they are halfway in the door, and it will totally depend on how their leadership and program committee take up the challenge to provide true learning opportunities of real-life issues, not only in academic institutions, but also in our day-to-day regional and smaller healthcare institutions. In my opinion it definitely requires a renewed face of the faculty from people who are not only thinking outside the box but also come from outside the “radiology box.” Only then, the SIIM conference will not just become a place to get continuing education credits but a foremost a place to exchange ideas, brainstorm solutions, and go back energized to implement what we learned. How is it that two months after this post, there are no comments? Is it because there is so much covered in this single post that it's hard to pick a place to start? Could it be that most of the findings are too controversial/provocative? There are a couple I could rally behind but most that I would take at least some issue with if even on the grounds of semantics. What do I need to know about HL7?